Fig. 1: In the standard but inaccurate cartoon of an atom, the nucleus is shown almost as big as the atom. It is true the nucleus is a loose cluster of protons and neutrons, but it is tiny compared to the atom. 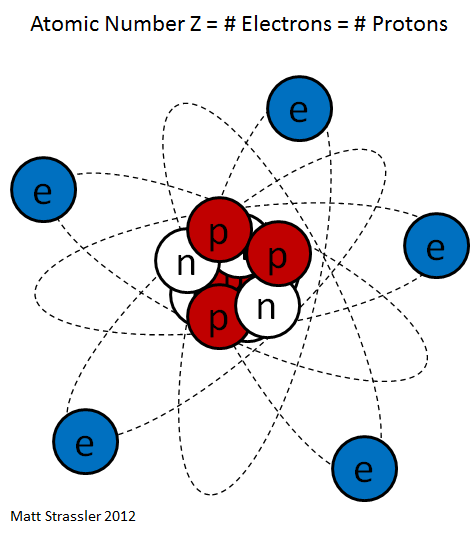 The typical cartoon drawing of an atom (Figure 1) greatly exaggerates the size of the nucleus, but it does represent the nucleus more or less properly as a loosely combined cluster of protons and neutrons. How do we know what a nucleus contains? These tiny objects are (and were, historically) simple to characterize because of three facts of nature. (where the “≈” symbol means “is approximately equal to”). where these equations are accurate to about 0.1%. Unlike the previous equations, this equation is exact, with no corrections. These equations are illustrated in Figure 2. Fig. 2: Illustration of the equations in the text. Electrons appear as blue discs, protons and neutrons as red and white discs; they are not drawn to scale in the images of atoms at upper left. The pink discs represent nucleons. Honestly, physicists of that time period were very lucky, from the scientific point of view, that things were so easy to figure out. The patterns of masses and charges are so simple that most lingering confusions were quickly eliminated once the neutron was discovered. If any one of the four facts of nature I listed hadn’t been true, then it might have taken a long time to work out what was going on inside atoms and their nuclei. Fig. 3: If a wall is completel solid, no objects of any size can pass freely through it. Unfortunately, in other ways it would have been much better if things were more complicated. The timing of this scientific breakthrough could hardly have been worse. The discovery of the neutron and the understanding of the structure of nuclei coincided with the international economic crisis often called the Great Depression, and with the rise of several authoritarian and expansionist governments in Europe and Asia. A race among leading scientific countries to understand and obtain energy and weapons from nuclei quickly began; reactors generating nuclear power were obtained within a mere ten years, and within thirteen, nuclear explosives. Today we live with the consequences. How Do We Know Nuclei are Small? It’s one thing to convince ourselves that a particular nucleus of a particular isotope contains Z protons and N neutrons; it’s another altogether to convince ourselves that nuclei are tiny and that the protons and neutrons, rather than being crushed together into a pulp or stirred into a stew, more or less retain their integrity, as the cartoon nucleus suggests. How can we confirm these things? so dense, thick and solid that there’s no way for light to sneak through. Well, you’d be right about there being no gaps; in a solid there’s hardly any space between one atom and the next. You can see this in the pictures of atoms obtained using special microscopes; the atoms are like little spheres (their edges being the edges of their electron clouds), and they are pretty tightly packed together. But you’d be wrong about atoms being impenetrable. Fig. 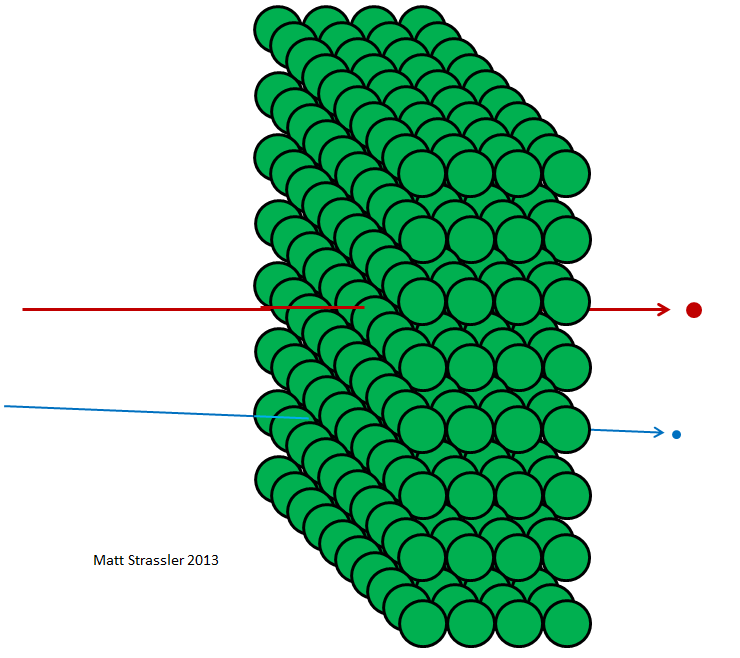 4: High-speed electrons or nuclei (not drawn to scale, in blue and red) can pass right through thin walls of atoms (green) without disturbing them or being disturbed, even if the walls are many atoms thick. This indicates atoms are mostly empty. If atoms were impenetrable, then nothing could get through the aluminum foil… not visible light photons, not X-ray photons, not electrons, not protons, not atomic nuclei. Anything you aimed at the foil would get stuck in the foil or bounce off, just the way a thrown object has to bounce off or stick to a plaster wall (Figure 3). But in fact, high-energy electrons can easily go through a piece of aluminum foil; so can X-ray photons, high-energy protons, high-energy neutrons, high-energy nuclei, and so on. The electrons and the other particles — almost all of them, to be precise — can go through the material without losing any energy or momentum in a collision with something inside one of the atoms. Only a very small fraction of them will hit an atomic nucleus or an electron head on, in which case they may lose a lot of their initial motion-energy. But the majority of the electrons, protons, neutrons, X-rays and the like just sail right through (Figure 4). 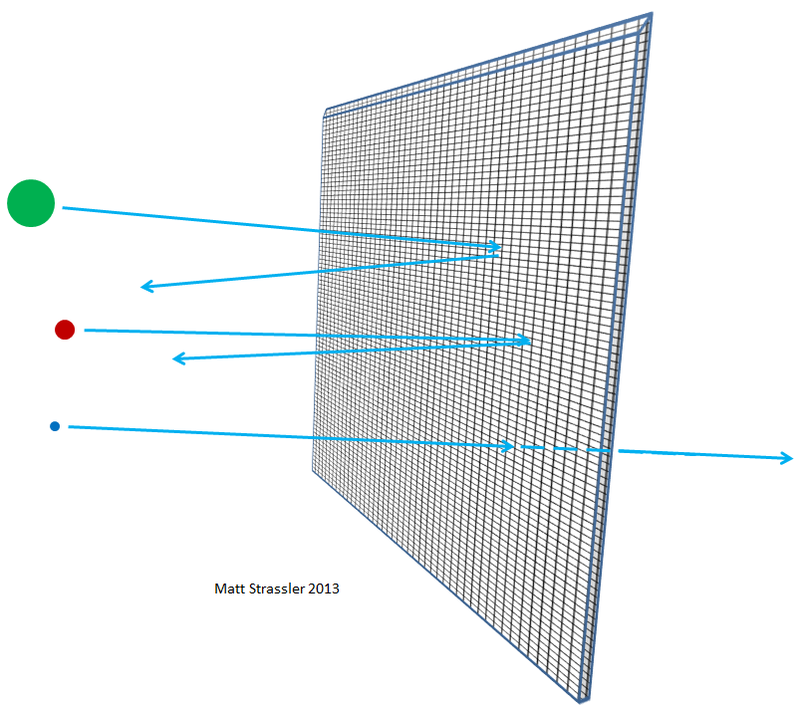 It’s not like throwing pebbles at a plaster wall; it is like throwing pebbles at a chicken-wire fence (Figure 5). Fig. 5: If a wall is full of holes, like a fence, large balls will bounce off, but sufficiently small balls will often pass through (though a few will still bounce off). The thicker you make the foil — for instance, if you stack more and more pieces of foil together — the more likely it becomes that the particles you are firing at the aluminum will hit something, lose energy, bounce back, change direction, or perhaps even stop. 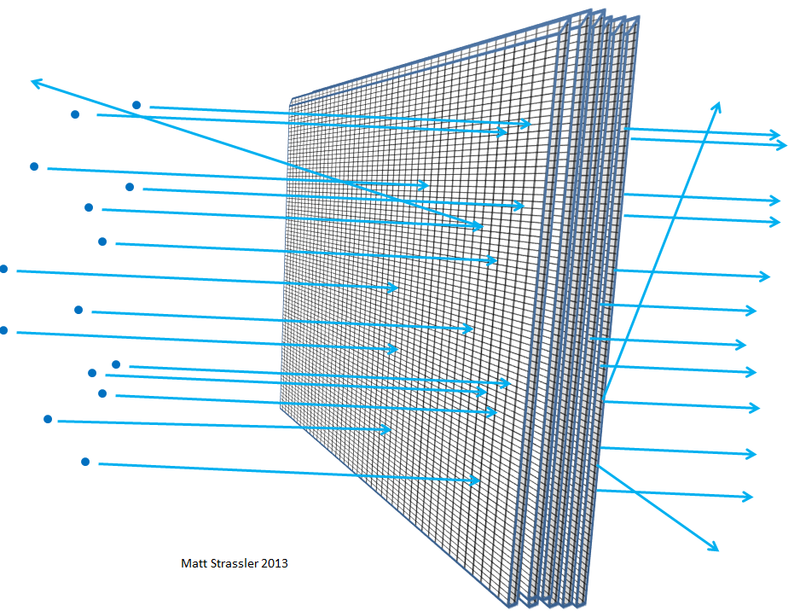 The same would be true if you had layer upon layer of chicken-wire fencing (Figure 6). And just as you could figure out, from how far an average pebble could make it through the layered fences, how big the gaps are in the fence, scientists can work out, from the distance traveled by electrons or atomic nuclei through matter, how empty an atom is. Fig. 6: The effect of throwing many small balls at a hole-ridden wall. 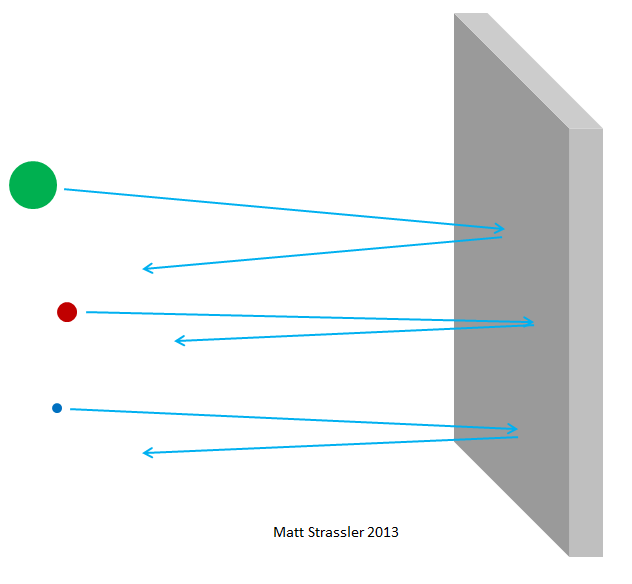 If a series of fences are stacked together (but not perfectly aligned), fewer of the balls will make it through; by measuring the fraction of the balls whose direction is changed, we can figure out how large the holes are in the wall. You might wonder whether the reason the particles are passing through the foil is the same reason that bullets can pass through paper, by pushing the paper out of the way. Maybe the first few particles are just pushing the atoms aside, leaving big holes for the rest of the particles to pass through? The reason we know that’s not the case is that we can do the experiment where the particles pass into and/or out of a container made of metal or glass, inside of which is a vacuum. If, as the particles passed through the container’s walls, they created holes larger than atoms, air molecules would rush in, and the vacuum would be lost. But when an experiment like this is done, the vacuum remains intact! It’s also not too hard to tell that a nucleus is a loosely organized clump, inside of which the nucleons retain their identity. We can already guess this from the fact that the mass of a nucleus is very nearly the sum of the masses of the protons and neutrons that it contains. This fact is true of atoms and of molecules too — their masses are almost equal to the sum of the masses of their constituents, except for a small correction due to something called “binding energy” [not an essential concept in this article] — and this is reflected in the fact that it is relatively easy to break molecules into their atoms (for example, by heating them so that they bang into each other more forcefully) and to break electrons off of atoms (again by heating.) In a similar way, it is relatively easy to break nuclei into pieces, a process called “fission”, or to assemble nuclei from smaller nuclei or individual nucleons, a process called “fusion”. For example, relatively slow-moving protons or small nuclei crashing into a larger nucleus can break that nucleus apart; there’s no need for the impinging particles to be moving near the speed of light. Fig. 7: In analogy to Figure 6, a beam (thick blue arrows) of subatomic particles (electrons, or protons, or helium nuclei, etc.) 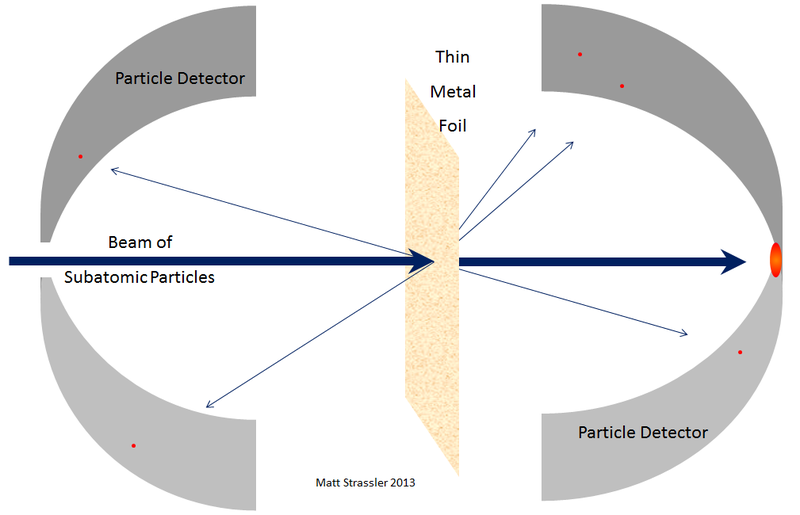 can be aimed at a piece of metal foil, and can be detected as they exit the foil (red dots). The fact the foil is full of holes is clear from the fact that most of the particles pass through (without breaking apart the foil, see Figure 4.) A tiny fraction of the particles change direction (thin blue arrows), some of them dramatically; this indicates that there are tiny and rather heavy objects somewhere inside the foil, which in hindsight we can identify as the nuclei inside the atoms of the metal. This famous experiment, which first suggested the existence of a tiny positively-charged nucleus in each atom, was performed by Rutherford in 1911. To understand that this isn’t inevitable, let me mention that we’ll see that these properties are not true of protons and neutrons themselves. 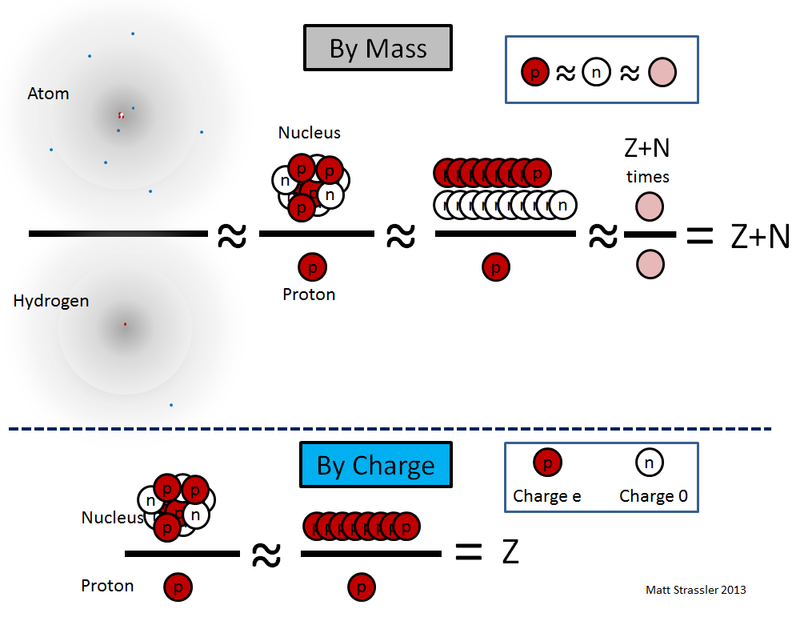 The proton mass is not roughly equal to the sum of the masses of the objects that it contains; there is no way to break the proton into pieces; and to get the proton to do anything interesting requires energies comparable to the mass-energy of the proton itself. Molecules, atoms and nuclei are comparatively simple; the proton and the neutron are extremely complex. A very succinct and informative article. I understand that electron orbitals are clouds. But particles are discrete. I understand that calling them “point like particles” does not mean they are tiny points. I understand that fundamental particles have no structure. But, i have a hard time not thinking of them as solid! That’s not too much of a problem, the ‘billiard balls’ model works fine at a distance. But I think the lack of solidity is a big problem in people’s conception of quanta. There seems to be a feeling that these phenomena are somehow ephemeral and not quite real, that they can vanish without warning or break the rules. But quanta *are* quite solid, you can’t split them or have half of them or make them vanish all of a sudden without consequence. They have (relatively) fixed speeds and masses and move about often as if they were little balls. Most of the ‘weirdness’ is just due to the fact that they don’t occupy a fixed volume of space. Their solidity, to me, has always seemed like everything *but* a solid surface. But possibly the professor can provide a better mental picture. In part they seem solid because the interactions that one would think of as collisions happen as you get two particles close enough. If you think of two points with positive electric charge, they’ll push each other apart even though they don’t “touch” directly. Also, particles are both clouds and points because the positions are probabilistic. The point can be anywhere; it’s just likely to be close to the middle of the cloud of probabilities. Thanks for this article. I actually had an interesting discussion yesterday over a beer on how the residual of the strong force can have a limited range / become weaker than the electromagnetic force at long distances yet be strong enough to keep nuclei together at short distances. (How geeky is discussing stuff like this over beer… ;)) The gluon is massless so the force associated with it should be infinite in range. I won’t spoil the next article, but the Wikipedia page on the strong force explains it very well. Particles must just be crystallised energy. That’s how I make sense of the physical side of quantum mechanics. But what then does ‘crystallized’ mean? Particles are not still, nor solid and those with an internal structure lack the regular, unchanging and ordered internal structure of crystals. I guess another way to think of it is that an Electron is an indivisible unit of negatively charged Electricity. So a Photon is an indivisible unit of light. The other fundamental particles are indivisible units of “something”. At the end of the day, water is not solid so i don’t see why quanta have to be. Also, we are so intrinsically entwined into reality with each other that we can not look at it objectively. So, whatever they “really” are is a complete mystery. One could say, we do not really know what anything is ! The design, supply and installation of driveway gates and garden railings & Automated Gates throughout the UK. https://fhenadzi.wordpress.com corrected table of elements.